Rick pushes his people to infiltrate a prison infested with walkers, in the hopes of finding a more long-term respite from their life on the move. While one of their own lies near death, the group encounters a handful of prisoners who survived the fall of the prison and who know nothing of the state of outside world. Andrea and Michonne are taken in by a group of survivors who have established a secure township under the leadership of "the Governor," a man whose true agenda may not be what it seems. The prison comes under attack, splitting up the group at a time critical for Lori. In Woodbury, Merle makes a personal request to the Governor while Andrea reluctantly prepares to leave. After a loss Rick enters the dangerous prison corridors alone, while the others look for a way to care for their newest member. Michonne presses her suspicions about the Governor, and Andrea witnesses the unpleasant underside of Woodbury. Andrea tries to find her place in Woodbury, unaware that Merle and his men are hunting Michonne in the forest. Rick receives a mysterious phone call that promises the possibility of a new refuge. 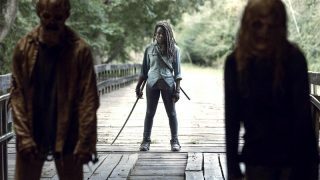 Michonne arrives at the prison with news that prompts Rick to try and infiltrate Woodbury. Andrea is asked to participate in a disturbing study involving a dying man, and Merle's prisoners face a harsh interrogation. Rick's attempt to rescue his people leads to a deadly shoot-out in the streets of Woodbury, while Michonne pursues her own agenda with the Governor. At the prison, Carl takes charge when a new group of survivors arrives in need of help. After a confrontation in Woodbury Daryl's loyalties are tested by both sides, and Rick's group threatens to splinter. A breach leaves the town in disarray, while newcomers at the prison raise concerns. While the Governor plans his next move, Daryl and Merle struggle over their differences -- leading to a crucial choice. When Rick's visions draw him outside the prison, Glen struggles with his newfound position of leadership. Andrea defies the Governor's wishes by leaving town and visiting the prison, where her old friends no longer know if they can trust her. Rick takes Michonne and Carl on a supply run to his former home town, where they encounter an old friend surviving alone on the edge of sanity. Rick meets face-to-face with the Governor to negotiate terms of peace with Woodbury, with Andrea caught in the middle and Merle threatening to destabilize the situation in his desire for revenge. As the Governor's true intentions become clear Andrea decides to flee Woodbury -- only to be pursued across the countryside. Meanwhile, Tyreese and his people are confronted with the underside of their new community. Faced with a terrible decision Rick decides Michonne's fate, but Merle takes matters into his own hands. The Governor unleashes his attack on the prison, only to discover that Rick and the others are not there. In Woodbury, Andrea finds herself locked up with a dangerous foe.